Xu, X., Padilla, M. T. and Lin, Y. (2014). Measurement of TACE Activity in Extracts from Cultured Cells. Bio-protocol 4(20): e1264. DOI: 10.21769/BioProtoc.1264. In cigarette smoke–induced and inflammation-associated lung cancer development, cigarette smoke extract (CSE) activates tumor necrosis factor-alpha (TNF-α) secretion from macrophages. TNF-α converting enzyme (TACE), also known as α-Secretase or ADAM17 (A Disintegrin and Metalloprotease), is a member of the ADAM family of metalloproteases. TACE mediated ectodomain shedding leads to the conversion of the inactive TNF-α precursor into the active mature pro-inflammatory cytokine. The SensoLyte 520 TACE (α-Secretase) Activity Assay Kit was used to detect TACE activity in CSE-activated macrophages. This assay is reliable, reproducible and easy to carry out in 96 well plate format. Amount of adherent cells needed for this assay are approximately 3 x 105 or 70 - 80% confluent cells per experimental sample in one well of 12 well plate. Add 0.1% (v/v) Triton-X 100 to Component C assay buffer. Incubate the cell suspension at 4 °C for 10 min on unidirectional rotator. Centrifuge the lysed cells at 2,500 x g at 4 °C. Collect supernatant containing protein sample into a new 1.5 ml microcentrifuge tube. Note: All kit components should be thawed to room temperature before starting the experiment. Protect light sensitive materials from exposure to ambient light. For TACE substrate solution, dilute TACE substrate (Component A) 1:100 in assay buffer (Component C). Note: For each experiment, prepare fresh substrate solution. Set up at least triplicate enzymatic reactions. Add 50 µl of protein sample (supernatant collected in step 1f) into black 96 well plate. Set up a 50 µl blank control containing assay buffer (Component C) only. The blank control well fluorescence reading accounts for the background fluorescence contributed by the assay buffer. In this case, the blank control functions as the reagent blank consisting only of the assay buffer used to lyse the cells; in general, the absorbance reading for this solution is typically subtracted from each sample absorbance reading in order to only consider the substance you are trying to analyze or measure. In the dark, set up a 50 µl positive control with the 5-FAM fluorescence reference standard: Dilute 1 mM 5-FAM (Component B) to 4 μM in assay buffer (Component C). Do 2-fold serial dilutions to get concentrations of 2, 1, 0.5, 0.25, 0.12, and 0.06 μM, include an assay buffer blank. Add 50 μl per well of these serially diluted 5-FAM reference solutions. Protect tubes and plate from ambient light. On lab bench, pre-incubate the plate for 10 min at room temperature protected from ambient light. Use TACE substrate solution equilibrated to room temperature. Add 50 µl of TACE substrate solution into each well (each well now contains a total volume of 100 µl). Mix reagents in plate by gently shaking by hand for 30 sec. Immediately quantify TACE enzymatic activity by measuring fluorescence intensity at Ex/Em=485 nm/538 nm. Use a protein quantification method, such as the Bradford assay, to measure total protein concentration in each experimental sample from the cell lysates prepared in steps 1c-f (He, 2011). The blank control well fluorescence reading accounts for the background fluorescence contributed by the assay buffer. Subtract the background fluorescence reading of the blank from each sample in order to only consider the TACE activity measured. Normalize the relative fluorescence units (RFU) of each experimental sample to its total protein concentration. 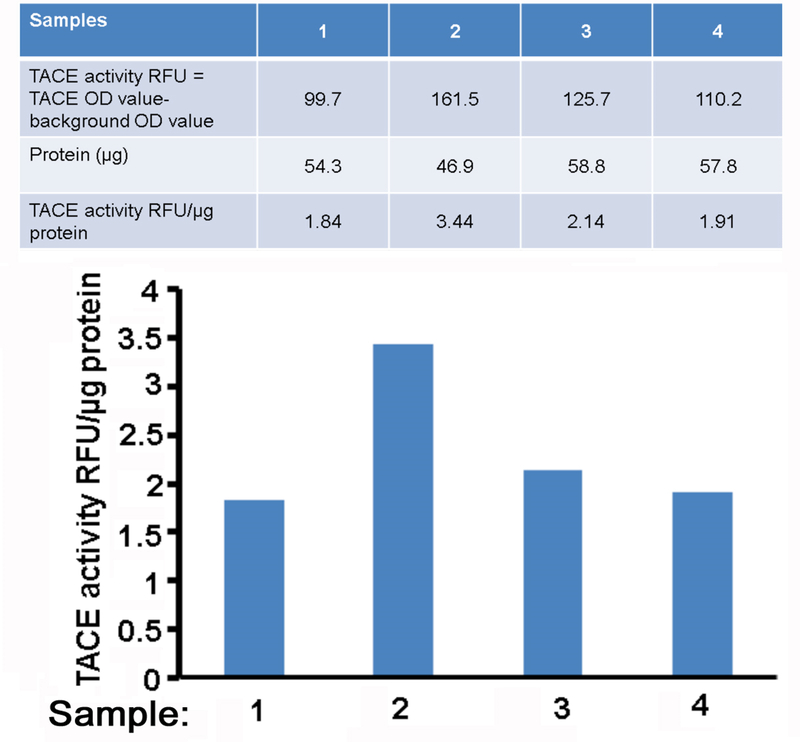 Plot the data as TACE activity RFU/ µg protein as shown in Figure 1. Ex/Em=485 nm/538 nm was used to detect fluorescence in cell lysates. Settings were modified from those recommended by SensoLyte 520 TACE Activity Assay Kit (excitation 490 nm and emission 520 nm) because the Fluoroskan AscentTM fluorescence plate reader used in this experiment is limited to this pair of excitation/emission settings. Measuring TACE activity may be repeated several times from 0 to 15 min to capture an optimal reading. Kinetic reading of TACE activity should be empirically determined for your experimental system. This protocol was adapted from a previously published paper Xu et al. (2014). This study was partly supported by grants from NIEHS/NIH (R01ES017328), NCI/NIH (R01CA142649), and the Office of Science (BER), U.S. Department of Energy (DE-FG02-09ER64783). He, F. (2011). Bradford Protein Assay. Bio-protocol 1(6): e45. Xu, X., Padilla, M. T., Li, B., Wells, A., Kato, K., Tellez, C., Belinsky, S. A., Kim, K. C. and Lin, Y. (2014). MUC1 in macrophage: contributions to cigarette smoke-induced lung cancer. Cancer Res 74(2): 460-470. How to cite: Xu, X., Padilla, M. T. and Lin, Y. (2014). Measurement of TACE Activity in Extracts from Cultured Cells. Bio-protocol 4(20): e1264. DOI: 10.21769/BioProtoc.1264.